Yes, the one on the far right, with the expensive camera around her shoulder. She is the Food Blogger. At least when our nosy neighbor asks her "What do you do? ", that is what she says with a toss of her head. Our neighbor is stumped, I tell you. These people, our neighbors, they do not have a modern outlook. All they know is to eat dal, bhaat, maacher jhol. And they also speak Bengali at home. What is this ? How can you advance if you don't speak English all the time ? This is modern world, no. But who will tell them ? They ask me, "If your wife is a food blogger, why do you do all the cooking in the house ?". "Arre Baba, I only cook dal, rice and chicken curry, my wife she makes rhubarb clafoutis", I tell them. Those moron neighbors look at me like they have never heard of rhubarb. People can be so closed and backward in this part of India, it is like you are in the forests of Congo or something. But to tell you the truth if I don't cook, what will the kids eat, what will I eat ? I cannot live on Hollaindaise sauce all my life can I ? Or a Blueberry Flan or even a Rhubarb Clafoutis ? My wife, she cooks only that from expensive books with glossy pages and bright pictures. Shiny kids with golden hair and a fairness that hurts, smile out of them. In the book they smile at the strawberry muffins set out on plates in a green meadow. Now my kids are not like that. They have black hair that catches the warm sun and they eat mangoes with juice straining down their brown elbows.I tell them to lick it up, like I did sitting on the branches of the mango orchard in my Grandma's village. My wife does not like mangoes.She makes strawberry creme fraiche for them.She is very very talented.She also knows all the right places to get out of season imported fruits. In the heat of Indian summer she manages to get strawberries. Yes, they don't look plump and juicy and don't taste that good but so what ? Also I have to agree that it is very expensive and it is hard for me to pay every month for all this, but what can I say ? She is so creative, I need to support her Food Blogging, no. The neighbors, the ones who do not know a rhubarb from a rabbi, tell me "Oh your wife must be making good money in blogging. Always she is buying celery sticks from Reliance Fresh , never kundru from the our local vegetable seller".Arre what money, who will click on those Google ads to give money ? Money minded they are as if everyone does things for money only. Did Van Gogh paint for money ? Did Steinbeck make rich in his life ? No, na. So ? Now what can I expect from such morons whose only aim to cook, is to eat that food. They don't even know what "plating" is. See, after my wife makes the creme fraiche or whatever it is, she does something called "plating". She puts the food in very beautiful plates, the ones we are never allowed to use for dinner and then arranges them with pretty flowers and napkins and silver candlesticks. Now I don't know why candlestick is necessary for food but it all looks very pretty. We watch from afar. The baby, the 3 year old wants to lick the creme fraiche but I hold her tight. My older child says he is hungry. I tell him to go do his Math homework till Mommy finishes work. My wife then starts taking pictures. Sometimes she gets on a step ladder and click pictures from top, at other times she sets up the camera on a tripod. She changes the camera lenses, places the plate on the ledge our balcony, lets it hang precariously and balances herself to take a closer shot.I stand there, my heart going "thud-thud", fearing that those expensive plates can fall 5 floors down. If my wife was born a few decades back, Satyajit Ray would have been very proud of her.I look at her with admiration. My wife takes like thousand pictures. In between she downloads them on her laptop and edits them.Too much work she does. I know the kids will soon ask for dinner. So, I start getting dinner ready, I wash the rice and the lentils and then put them in the pressure cooker. I chop onions, peeling their magenta skin carefully and then slicing my knife through them. I like cooking our meals, it gives me a lot of satisfaction to see the kid's happy faces as they enjoy my chicken curry. My wife used to cook before, 'before" as in before she became a Food Blogger. She would make charchari, jhinge posto, tyangra maacher jhaal. But now she only makes things we cannot even pronounce well. She says they picture better.Also everyone makes dal, shukto and chicken curry. What is so great about that ? It is all your middle class Bengali upbringing, she scorns. All is well, I think. If she started taking pictures of our everyday food, we would never get to eat anyway. And anyway everyday she is so busy, where is time to cook ? In between Twitter, Facebook and her blog she can only make those things that she can blog about no ? Let her make creme fraiche and pour billows of shaving foam on it to make it look better. Who cares ? I am feeding the family, no. I am liking it also, so what is your problem ? 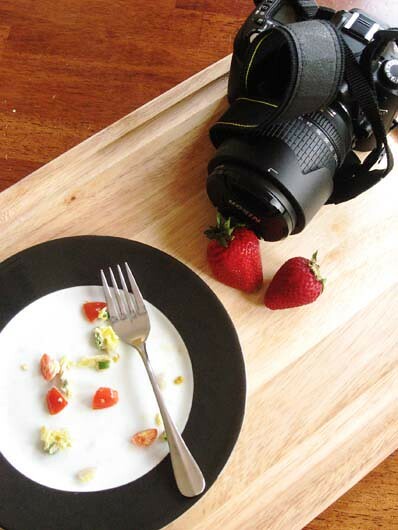 Everyone cannot be a Food Blogger, can they ? Only today I am late and don't have much time so I will make dal, rice and omelette. My wife likes omelettes with onion, green chili and tomatoes.I don't think she will eat the strawberry creme fraiche, what with the foam and the shriveled berries it might be actually poisonous. Tomorrow she can write how decadent and delicious it was, how her family enjoyed it and post pretty pictures of them with candlesticks around. This is my entry for Of Chalks and ChopSticks, a food Fiction event started by Aqua last year. After a period of dormancy it is hosted this time by Sra. This time Desi Soccer Mom suggested there should be a photo cue and the picture Sra had showed a camera, some strawberries and a man's hand holding the camera. Since I generally like to do timepass, I enjoyed writing a food fiction after a long time.Any resemblance to people in real life is totally unintentional. Omelettes are my all time favorite food. I can write lengthy paeans on it. If I did not have kids and did not have to blog, I could survive on Omelette alone. 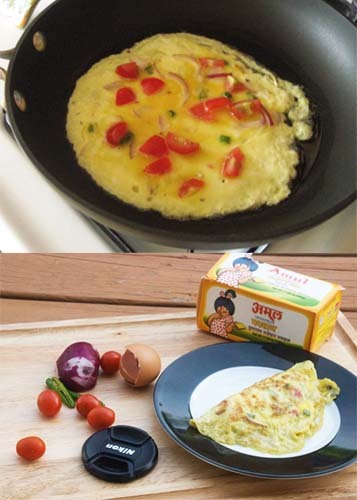 Toast & Omelette for breakfast, rice-butter and omelette for lunch, Roti rwapped around an omelette for dinner. Perfect, happy life and then came the vegetables and spoiled it all. Arrrrrrrgh. 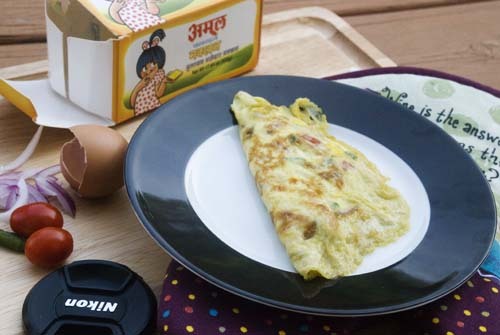 To make an omelette like ours, crack an egg into a bowl. Add 1 tbsp of Milk. Beat with a fork till frothy. Add chopped onions, chopped green chili and chopped tomatoes. Add salt to taste. Mix. Heat Oil on a fry pan. 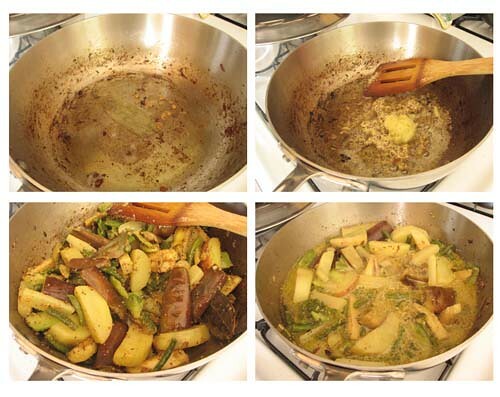 Pour the pale yellow egg mixture and swirl the pan around a little, so the egg mixture makes a circle. At low heat cook till the omelette looks flippable(check the edges, should look done). Slide a spatula gently under the cooked side and flip. Cook the omelette on the other side. I have never admitted this before but I think on some days, I expect a lot from BigSis. With the little one throwing her signature tantrums, the Dad having fun with erratic schedules and my PMS stretching to a month, I forget that BigSis is only a 7 year old. And a very mature, good hearted 7 year old at that. If I think of my 7 year old self, I remember nothing. On trying hard I see a shy girl who thought "Ekkuze Me" translated to "going to pee". Yes, I was that dumb. Fast forward to BigSis who in spite of having her moments is such a huge help when she sees Mommy has too much to do. She packs her lunch bag with her snack the night before, fills up her water bottle for school, dresses herself in the morning without much help, does all her homework without being asked to and acts pretty responsible most of the time. She is also extremely generous with her stuff and doesn't complain much if LS scribbles a horrific A on the pages of her brand new diary. She eagerly shares everything with her little sis(who btw finished her didi's box of tic-tacs hiding behind a couch) and if I give her a chocolate for snack at school, she brings that back to split with the sis. The biggest help in the last few days has been letting LS sleep in the crook of her arms at night. For that I can tuck them in and come away to finish off my work. Else I would be lying there for all of 30 to 60 minutes and praying to the Universe while LS tossed and turned. And yet when she gets buttons of her sweater wrong, skips her piano practice and climbs on her Dad's shoulders, we tell her "Tumi ar boro hole na(you haven't grown up at all)", always forgetting that she is only 7 after all. 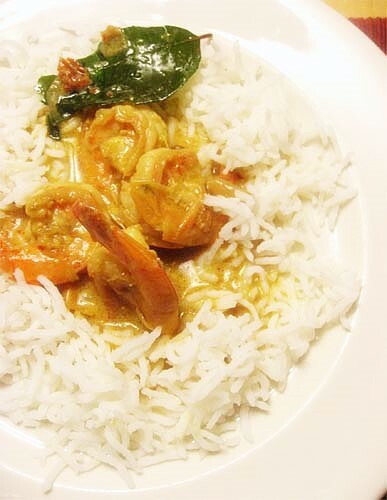 I made this Goan Shrimp Curry on a recent weeknight. Don't ask me why I would do such things but things happen. I based this on the Goan Chicken Curry from Anjum Anand, but since that was pretty mild I hiked the Red Chili in this one. If you are a wimp when it comes to Red Chili, go with the alert and stay safe. 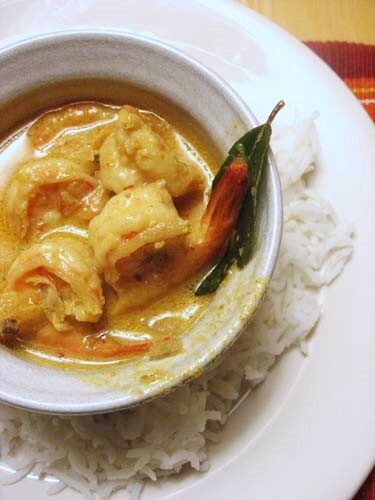 Also inspired by a recipe of Shrimp Curry my sis-in-law had sent, I used Coconut Milk to make the gravy and added few Curry leaves for flavor. That totally took the taste to a whole new level. It was creamy, rich with a lightly sweet coconut taste and bursting with flavor. Everyone who had it loved it. It tasted very close to the Bong Prawn Malaikari and you realized how Coconut smudges borders. I called it Bong Mom's version simply because there are so many variations out there and I am no Mario Miranda to vouch for its authenticity. I insist that you make it this Saturday, that is tomorrow, come on now. Put all of the above in a blender jar and make a paste with minimum or no water added. Note: Instead of the Roasted Cumin and Corriander Powder you can use same amount of Cumin & Corriander seeds. Toss 20-25 shrimp in salt and little turmeric powder and keep aside for 10-15 mins. To the same oil, add 1 large onion sliced or chopped fine and two hot Indian green chili sliced, cook until browned. Add the Goan Red Spice paste and cook for 5 minutes. Your nose might tingle with the sharpness of the chili. Add 1/2 of a large tomato chopped, salt to taste and cover and cook until the tomatoes have softened and reduced. Uncover the pan and cook the tomatoes further in their juice for 6-8 minutes, stirring in between till you see oil separating from the masala. Add about 1 cup of unsweetened thick Coconut Milk + 2/3 cup of warm water. Throw in a few curry leaves. Add salt to taste and adjust for sweetness, hotness etc.. Let the gravy come to a boil. Remove from heat, cover and let it sit for 40-45 minutes. Warm and serve with White Rice. It is superbly delicious. Now, if you know me or even if you don't, you should know that I am not your regular everyday shukto making kinda gal. Heck, I am not even a gal any more, but that is besides the matter. I do not get up at 5 in the morning and make shukto, dal, maacher jhol and bhaat. Ok, so nobody does that anymore. No one gets up at 5 apparently. I do at 5:30, tap the snooze button and drag myself out at 6. But even that is besides the matter. The crux of the matter is I am not the kind who can make shukto without a thought and with a song on their lips. I cannot cook shukto for 20 people coming home for dinner. I have to weigh the decision in my head for several days, shrug off a near reached decision several times, make long lists about six different vegetables, tear them off and then eat a sandwich from Panera. After all this the shukto gets cooked probably twice or maybe four times in a year, once in each season, not bad. This does not mean that the husband, who loves shukto more than anything does not get his fill. I have enterprising friends who cook shukto and more for 20 people. I do not have to bow down to any sentimental pressures. When I last posted my Shukto recipe in 2006, in the beginning days of my blogging, my Ma was here and she was the one who barked out the instructions. That post had several comments, some said the standard "great recipe", a couple made it and liked it, someone protested about not using "radhuni". Now radhuni is an elusive ingredient in my pantry. Honestly, I have never used it. 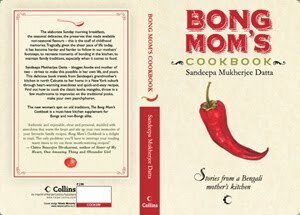 My Ma, her mother my dida all being probashi bangalis(bengalis settled outside of West bengal) adjusted and substituted in absence of this spice which you rarely find outside Bengal. I have friends who bring radhuni by the pound from Kolkata. Maybe because I have not grown up with it, I have never felt the need. Now radhuni is also referred to as "wild celery seeds" by wiki.I did not find "wild celery" and got regular "celery seeds" for my shukto this time. Everything else was exactly same as I have always done. The "celery seeds" did not do any magic. The Shukto tasted just like before. If you have the real "radhuni" seeds it sure will add a whole lot of flavor. Having said this, let me make it clear that if you do not like my shukto, pick up the phone, dial 011-91-33 and any number after that and get the detailed recipe from your Mom, your Ma-in-law, your aunt, your uncle or anyone who is the shukto master in your family. You can even skype. It is easy now days. It does not cost a bomb to outsource a recipe from overseas.Tell me what they said and we can chat. You can also add drumsticks, zucchini etc. Wash and chop the vegetables along the length. See pic here. Fry the vadi(10-15 small ones) till they are brown and crispy. I did not have any this time and skipped. Add 1/2 cup whole Milk + 1 Cup water. Add salt to taste. 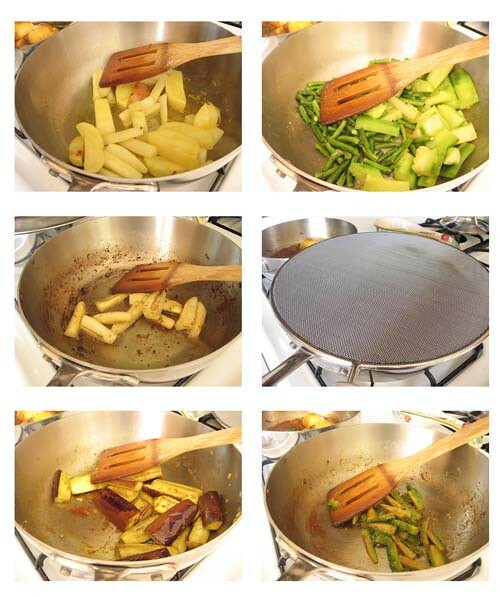 Cover and cook till veggies are cooked well. If you want gravy, add little more milk + water and cook. I wasn't really in a mood to write anything today. And then I cam home in the afternoon and found a blissful silence, not an uncanny one like this but a total peace and quiet which is very very rare in my home. The Dad was back from his trip and had taken the kids out for groceries. I had moments to savor on my one, to sit with my feet curled up and enjoy one uninterrupted cup of tea. But that was not to be for there was a lone mango in the fruit basket. I could have used it up later but No, I had an inane desire to eat doi-muri-aam right then, even before the tea, before anybody came home. Doi-muri-aam crawled out from crevices in my memory and beckoned like no other. You see unlike most Bongs whole love Dudh-Muri(Milk & Puffed Rice), Dudh-Bhaat(Milk and rice) etc. I hated anything mixed with milk. 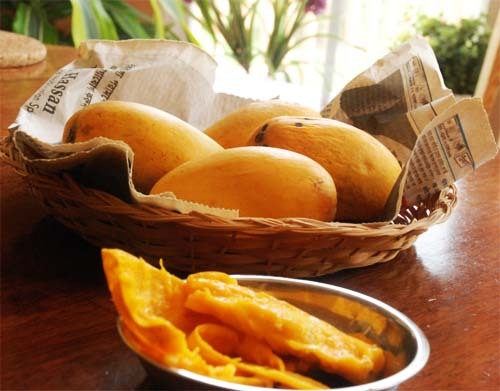 So during the heat of summers when mangoes were in plenty and everyone was finishing their meal with dudh-bhaat-aam(milk + rice + mangoes) or dudh-ruti-aam(roti instead of rice, all other same) I preferred my Mangoes just by themselves. The only concession I made was for chire-doi-aam(beaten rice aka poha with yogurt and ripe mangoes) and occasionally doi-muri-aam(puffed rice with yogurt and mangoes). I loved chire doi aam so much that every Tuesday during the summer month I tagged along with Ma to do Joi Mongolbar, a ritual that involved some praying and largely surviving the day on choicest fruits of the season. 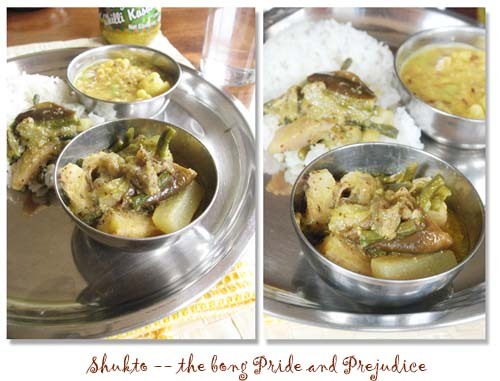 Lunch for Joi Mongolbar was always Chire Doi Aam, with sandesh and other summer fruits like lychees playing along. Today the lone mango brought back my cravings but it had to be quick so I settled for muri instead of chire.I gulped it down after clicking a few pics and sighed in delight. 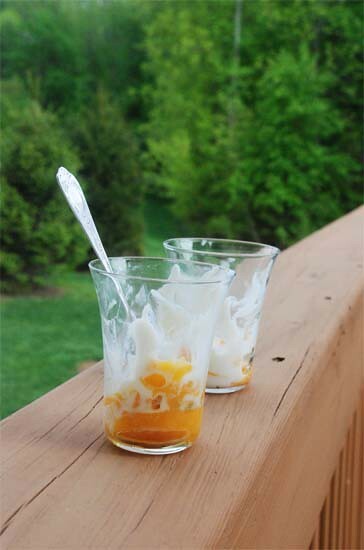 When the girls came back, they demanded mango lassi, seeing the yogurt stained glasses. Instead, I told them about muri-doi-aam. They showed no interest whatsoever. Take a parfait glass. Drizzle some honey on the bottom and along the inner surface of the glass. 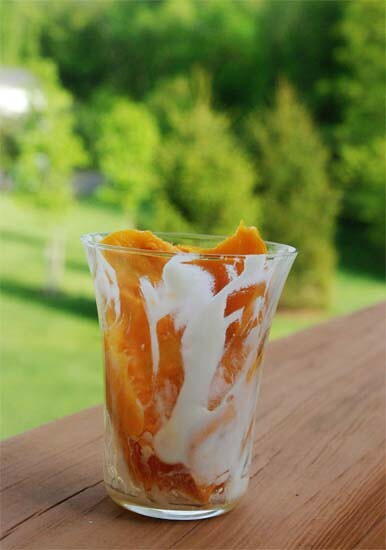 Scoop pieces of sweet mango and put on the bottom. 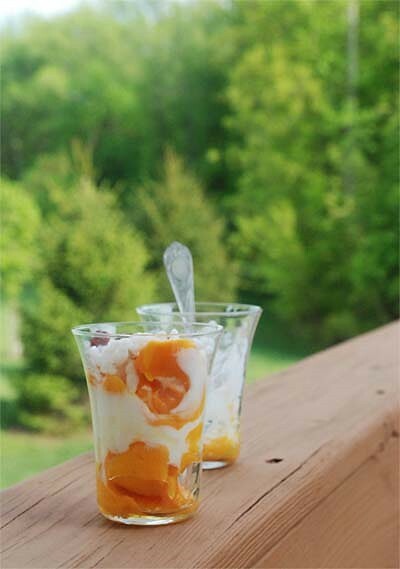 Follow with scoops of thick, hung yogurt(yogurt strained for 3-4 mins should be fine). Heap more mango pieces on top. Sprinkle some crispy puffed rice for a bite. Garnish with craisins if you wish. Mix with a spoon and enjoy. In the non-fancy version, which a normal person would rather do, you procure a big bowl, throw mangoes, yogurt, puffed rice, honey or sondesh and mix all of the above in no particular order. Proceed to eat with fingers. Licking is allowed. Check out some wonderful salad recipes here.